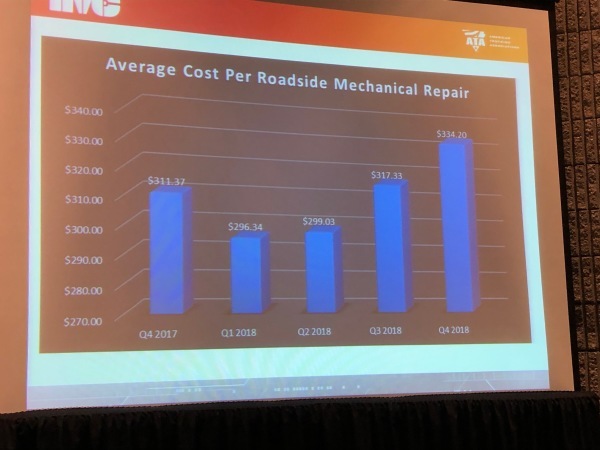 ATLANTA, Ga. – Data from several truckload fleets suggests the costs of individual roadside breakdowns and repairs were on the rise in 2018, reaching an average of US $334.20 when excluding tire-related repairs. Jim Buell, FleetNet America’s executive vice-president of sales and marketing, blames tariff-related increases in parts prices, as well as higher labor costs linked to a technician shortage. The data emerges from a quarterly benchmarking survey conducted by TMC and FleetNet America, which for the last year has focused on roadside maintenance among truckload fleets. There’s a specific reason for the roadside focus. “It costs more to fix something on the side of the road,” Buell said. About four times as much. Comparing the fourth quarter of 2018 to the same period in 2017, the greatest cost increases were linked to lighting systems (up 12%), cab and sheet metal (8%), and trim and miscellaneous hardware (36%). Cooler weather from October to December increased the miles between tire repairs to 32,884 miles, compared to 22,017 miles from July to September. But one fleet actually ran 124,622 miles between unscheduled roadside tire repairs. Lighting systems tended to run 69,973 miles between repairs, costing $261.46 each. “Maintenance practices appear to have an impact on reducing lighting repairs and controlling that expense. One fleet ran 1.4 million miles between lighting repairs or 20 times better than the vertical average,” a related report suggests. Brakes were running an average of 74,924 miles between repairs, reaching $385 each. In contrast, the best-in-class fleet ran 19 times the miles between repairs. Repairs to wheels, rims, hubs and bearings ran $128.57. But the best in class fleet ran 705,154 miles between unscheduled repairs – four times the average. The three most frequent cooling systems repairs were to the water pump, radiator and fan. Water pump assemblies saw the most dramatic decreases when compared to the same quarter in 2017. The best-in-class fleet tripled the miles between repairs. One fleet actually ran 75,528 miles between unscheduled roadside repairs on the whole – about seven times the vertical average – during the most recent quarter. And it has been making gains for three quarters. But even it is not the leader in every class, Buell said. There is still room to improve. FleetNet is not releasing the number of fleets or repairs being tracked. The benchmarking program is to extend to LTL and tanker operations in the near future. Those that want to participate simply have to share information on all of their unscheduled roadside repairs, and ensure the information carries accurate VMRS codes to ensure individual items can be compared.